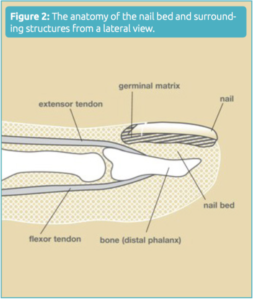 Nail bed injuries can be very painful and prevent you from using your fingers; however, these injuries are treatable. These injuries are typically a result of incidents such as catching the fingertip in a door. Any type of pinching, crushing or sharp cut to the ngertip may result in a nail bed injury. Simple crushes of the fingertip may result in a very painful collection of blood under the nail. More severe injuries can result in the nail cracking into pieces, part of the nail or fingertip being torn off, and/or other injuries to the finger. Your doctor will ask you information about how the injury occurred. X-rays may be taken to look for broken bones that may require treatment. Your doctor may not know the full extent of the injury until the nail is examined closely, which means you would be given local anesthesia. Other medical conditions that may affect healing should be discussed with your doctor. The goal in treating such injuries is to restore the nail and/or finger to how it was before. Collections of blood are drained by making a small hole in the nail in order to relieve the pressure and provide pain relief. More serious injuries may be treated with surgery and/or need splinting. Some nail bed injuries can be fully repaired, and your nail could return to normal. However, some severe injuries may result in a deformed nail. 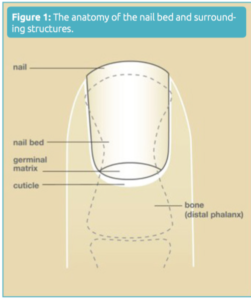 Deformities are likely to happen if the base of the nail bed (where it is crescent-shaped) is injured. It normally takes 3-6 months for a nail to grow from the cuticle to the tip of the finger.